Sonia Rykiel was born Sonia Flis in Paris on 25 May 1930. She married Sam Rykiel in 1953, and was initially inspired to design clothes by her own desire for fashionable maternity wear when she was pregnant with her first child. The clothes she designed were then sold in her husband's boutique, Laura, which he started in 1962. With the opening of the designer's first Sonia Rykiel boutique on the Left Bank in 1968, she spearheaded the boutique movement of small shops selling avant-garde clothes in France at a time when women of fashion were rejecting the constricted styles of haute couture and seeking clothes that projected a more youthful and modern image. The early 1960s were a time of massive cultural upheaval when many social institutions underwent major changes, including haute couture. Along with Emmanuelle Khan, Yves Saint Laurent, and Dorothée Bis, Rykiel was responsible for a dramatic shift from status dressing to the youthful informality of the Rive Gauche. With her extraordinary mass of red hair, pale complexion, and trademark black clothes, she typified the look of Left Bank bohemia. It soon became apparent that Rykiel's strength was in knitwear design, and she helped to transform a medium previously dismissed as old-fashioned into one associated with covetable items for the young. Offering her clothes in such fashionable New York stores as Henri Bendel and Bloomingdale's, Rykiel was nicknamed the "queen of knitwear" in 1964. 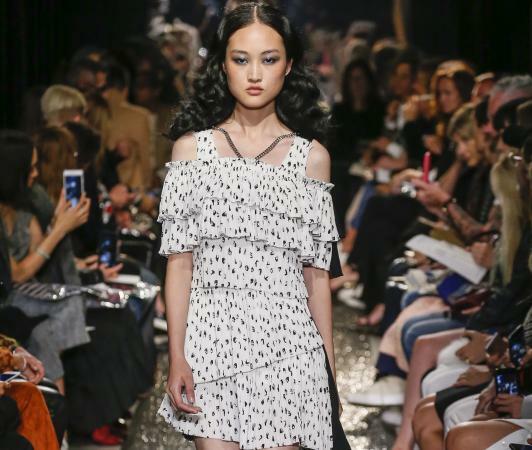 Rykiel created her signature silhouette by cutting the garment high in the armholes and close to the body, with narrow sleeves that elongated the torso. Using a distinctive palette of colored stripes against a backdrop of black, her designs for knitwear often involved such innovative details as lockstitched hems, reversed seams, and carefully placed pockets. All her clothes tended to be lighthearted with an element of wit, whether in the use of contrasting textures and shapes or in the detailing. In the early 1980s Rykiel began to add words to her clothes- for example, "Black Tie" spelled out in studs on a black leather jacket, or "Special Edition Evening Dreams" emblazoned in rhinestones on the belt of a black lace dress. As the fashionable silhouette became looser during the 1980s, Rykiel emphasized relaxed tailoring and geo-metric layers. She diversified into household linens in 1975, with children's wear, men's wear, shoes, and fragrance following in 1993. Her flagship store on the boulevard Saint-Germain opened in 1990. Rykiel has become a French institution. She received the medal of a Chevalier de la Légion d'Honneur in 1985. Her thirtieth-anniversary show was held in March 1998 at the Bibliothèque nationale de France. See also Boutique; Paris Fashion; Yves Saint Laurent. Sonia Rykiel, Hélène Cixous, and Madeleine Chapsal. Rykiel. Paris: Herscher, 1985.